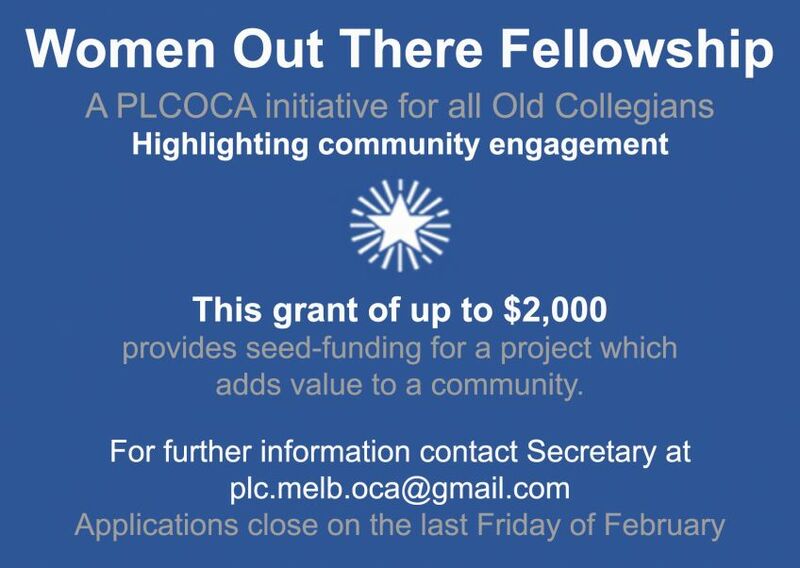 This Fellowship is made available by and for Presbyterian Ladies’ College (Melbourne) Old Collegians’ (PLCOC) on an annual basis and is based on funding derived from the investments managed by the Presbyterian Ladies’ College (Melbourne) Old Collegians’ Association (PLCOCA). Currently, the amount available is capped at AUS $2000 for 2018. More than one smaller grant may be made with an aggregated value of $2000. Promote the work of PLCOC in their community. Selection of the Fellowship recipient(s) in any given year will be determined by a committee. The Fellowship Selection Committee will include at least 3 people, one nominated by the PLCOCA Committee, one elected at the AGM of the PLCOCA and a Chairperson who will normally be the President of the PLCOCA or nominated by the President. the relevance of the project to the aims of the Fellowship. The committee will inform the PLCOCA through the President of the names of the successful recipient(s)and their project(s). The committee’s decision will be final and no correspondence will be entered into. The President will formally notify the successful recipient(s). The successful recipient(s) must agree to complete the project within 12 months of receiving the funds and submit a report to PLCOCA. Submit your completed application with all attachments before the submission deadline taking into account time zone differences. Late submissions will not be accepted. Your application should clearly articulate your project’s boundaries specifically if it is part of a larger project. The Fellowship targets projects that require seed funding. Any application should emphasize this. (It may be that you require seed funding for the development of an extension of an existing project that otherwise would not be funded. Clearly differentiate the development aspect from the overall project in your application). Your budget should not exceed the $2000 limit of the 2018 Fellowship(s). The judges do not wish to compromise a project by providing limited funds. It is your responsibility to ensure that the funds being sought through the Fellowship will enable you to meet your project goals. Supporting documentation is required where resources ‘in kind’ are nominated in the application such as, the use of or access to facilities essential to the project’s success. Your referees will contribute to the success of your application. They should describe their knowledge of your skills and ability to meet the goals of the Fellowship and to implement the program described in your application. Provide them with a copy of your application and the Fellowship goals. Highlight the requirement to meet Fellowship goals to ensure they address this in their report. The Applications for 2019 are open and close in February 2019.